The late fifties was an extraordinary epoch in history. America was going through many powerful, fundamental changes in rapid succession. From the despair and desperation of the depression, the country was thrust into the terror and ferocity of World War II. America’s might brought victory, and from there society’s emotional roller coaster ride accelerated to dizzying new heights in the fifties. America was the unquestioned leader of the world: economically, militarily, and technologically. Heads were spinning as new ideas, new products, and new life styles constantly came forth. Even the sky was no longer the limit, as we prepared to enter the Space Age. 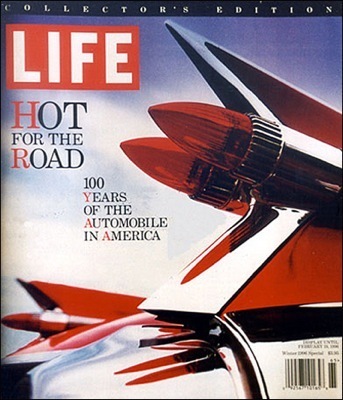 Proliferation of television, jets, rockets, atomic bombs, and Rock n Roll all came within a decade. What was next? In this electrifying time, the automobile became a central possession of modern life. 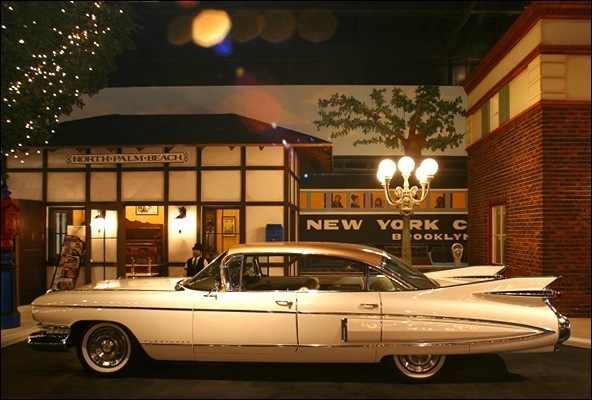 Cars were no longer just transportation, they showcased a growing attention to style. 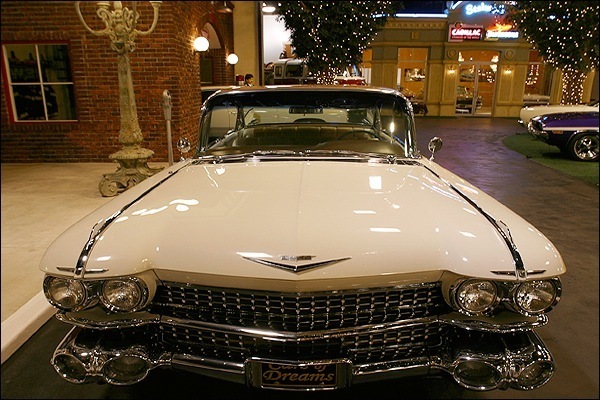 Nowhere was the lavishness and unrestrained feeling of the time better brought to form than in the 1959 Cadillac. 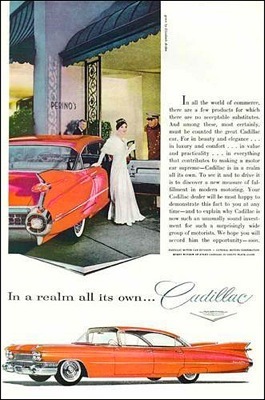 Cadillac was “The Standard of the World”. 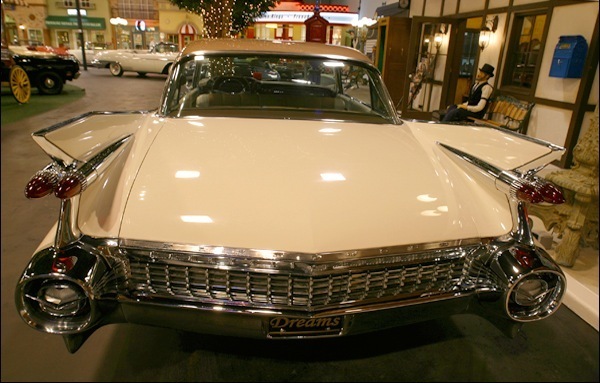 From its beginning, Cadillac led the world’s motorcar manufacturers in successfully bringing out the most important design innovations. 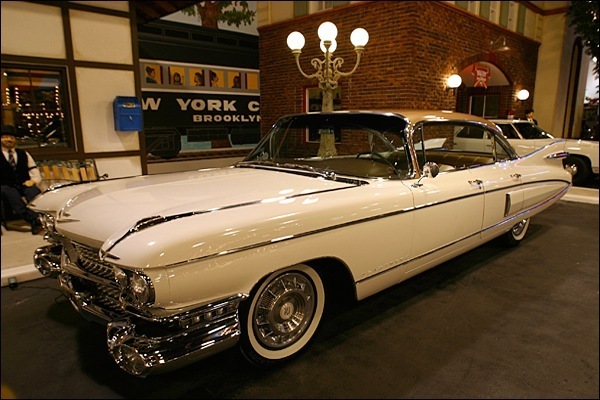 Cadillac was the first with precision machining of parts, the first with interchangeability of parts, the pioneer in multi-cylinder development, the first with electrical and starting systems, the first with synchromesh transmissions, and the first with modern chrome plating, to name just a few. The post-war years saw Cadillac further its technological lead with the most advanced automatic transmissions, used by Rolls-Royce, and the most powerful OHV V-8, in its debut year winning three of the top dozen places at Lemans. 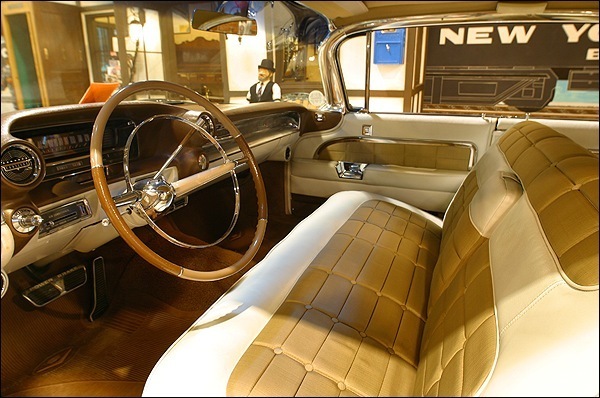 The world also looked to Cadillac for the luxury options of the future, such as cruise control, and automatic air conditioning. Cadillac’s most visible lead, however, was in styling. 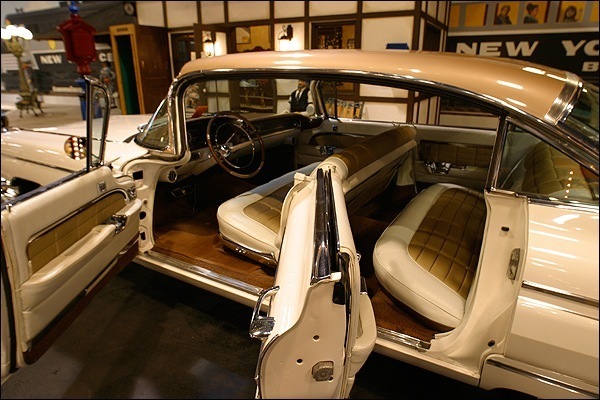 Cadillac was the first to set up a styling and design studio, and continued to create the major trends. 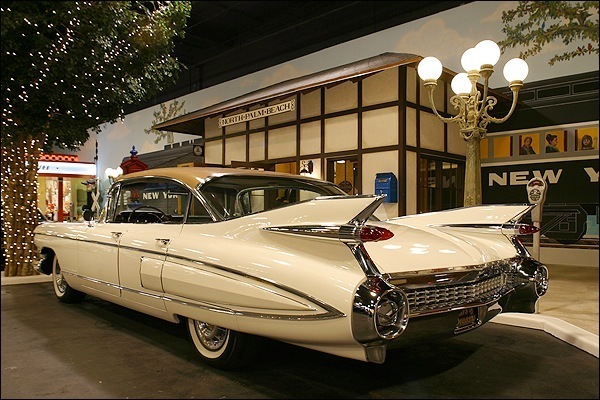 In the fifties, Cadillac had already introduced wrap-around windshields, the dropped door line (the “belted” look that lasted more than a decade), forged aluminum wheels, fabric covered tops, quad headlights, and, of course, fins. Fins are the most notorious styling trend of all times. 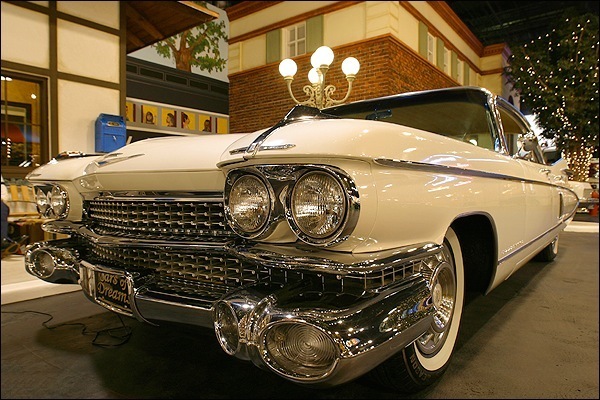 Fins influenced automobile manufacturers throughout the world for more than a decade and a half. 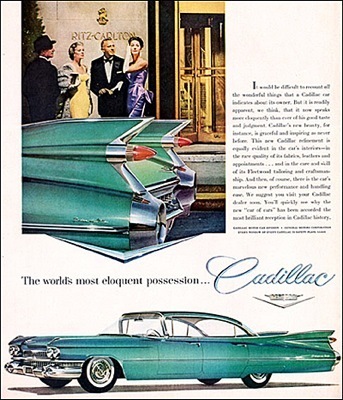 Cadillac’s fins were timidly copied by Mercedes-Benz and other luxury car makers. The fin styling theme spread to a host of industries in addition to the automobile – even conservative Chris Craft boats had a half dozen high finned models. 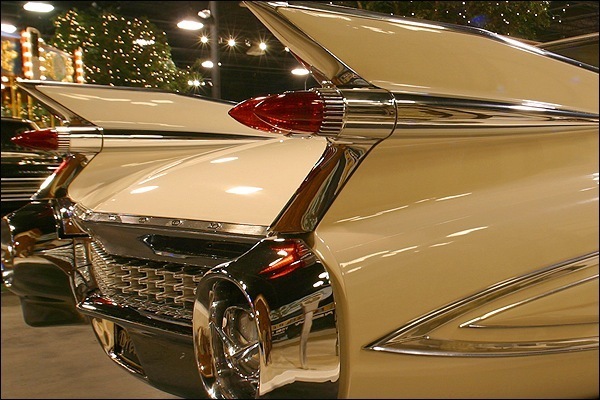 Cadillac was the first with fins, starting with the 1948 models. 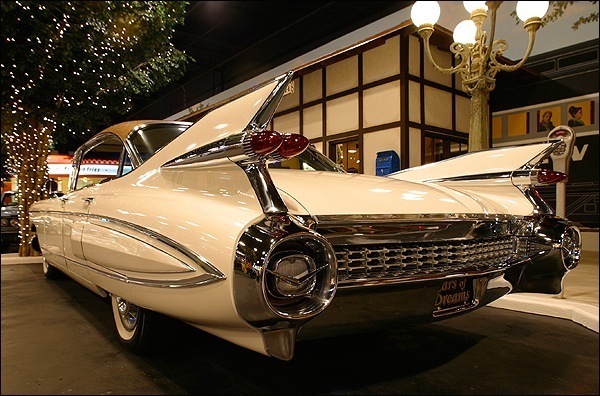 Every year from 1955 to 1959 their fins grew in size and height, and Cadillacs grew the most. The 1957 models had modest fins that shot up to dagger tip dorsals in 1958. 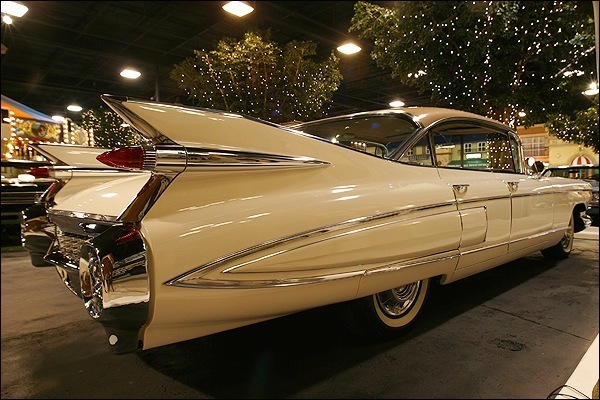 The all new 1959 models took the tailfin to its maximum height, parking the taillights almost at the drivers eye level. The grille encompassed two rows of brightwork, separated by a broad, horizontal bar of chrome. The brightwork was repeated between the taillamps in a dummy grille. 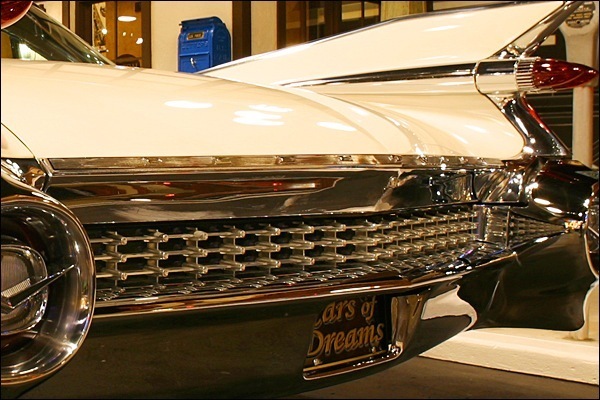 Together, the fore and aft grilles evoked the early jet aircraft of the era. The heavily hooded, quad headlamps were accompanied by massive quad turn signals housed in the bumper. That quad theme carried all the way through the car to the twin taillamp nacelles in the elaborate rear tailfins. The entire effect was that of a jet aircraft, exactly the spirit the designers at Cadillac were hoping for. 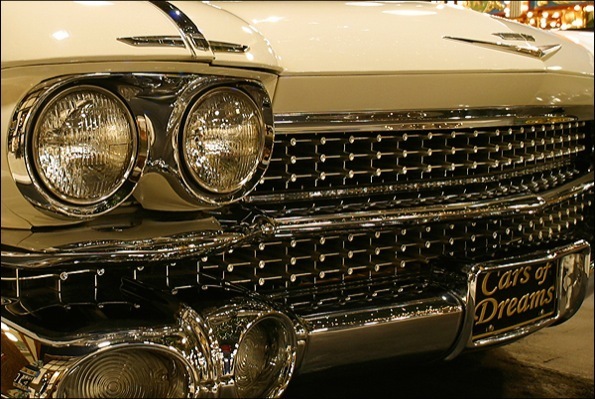 1959 Cadillacs are already the most publicized American luxury car of all. 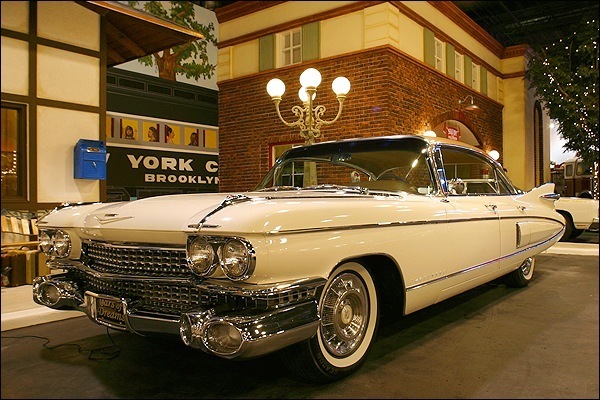 Many indicators suggest that 1959 Cadillacs will become the most notable post-war American car among collectors. For example, no other make and year car has received so many WANTED ads year after year in Hemmings Motor News, the “bible” for collector cars.